The wealthy banker Lionel de Rothschild bought the Exbury Estate, in Hampshire, in 1919. In 1922, work began on creating what is now a 200 acre garden, internationally famous for its rhododendrons, azaleas, rare trees and shrubs. 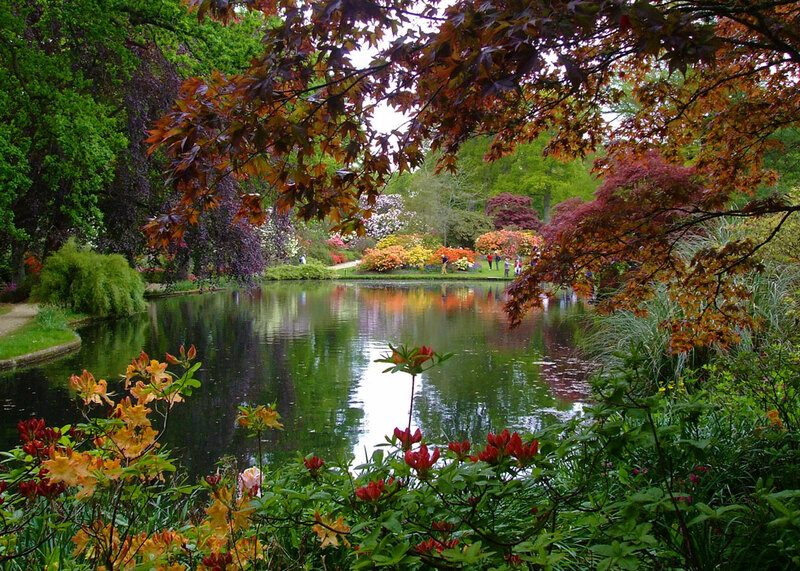 Exbury Gardens are open to the public, nestle on the eastern edge of the Beaulieu River in the New Forest National Park and are just wonderful for wandering idly through on a spring day. 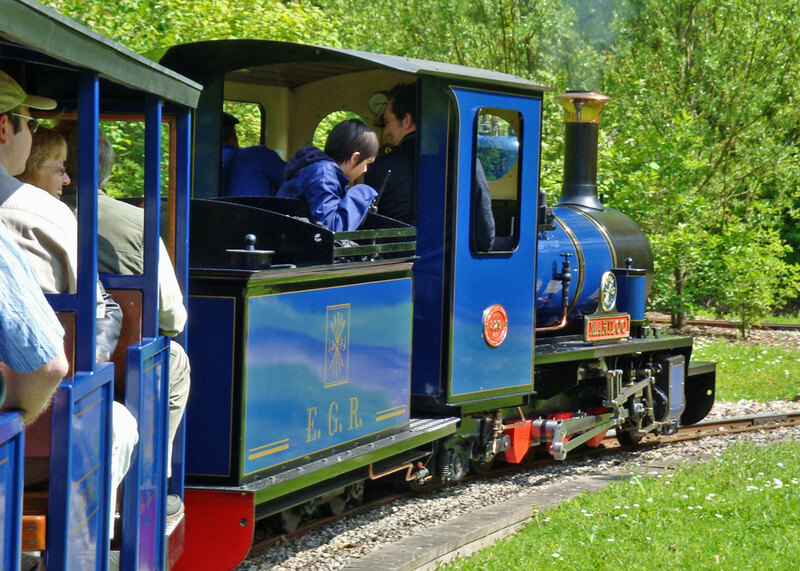 In 2001, a 12¼ inch narrow gauge steam railway opened on the site, which offers a relaxed tour amongst the foliage. This was a dream of Leopold de Rothschild, who wasn’t allowed an electric train set as a child…see what happens, when one deprives youngsters? The station is modelled on the one in Aviemore, in the Scottish Highlands. 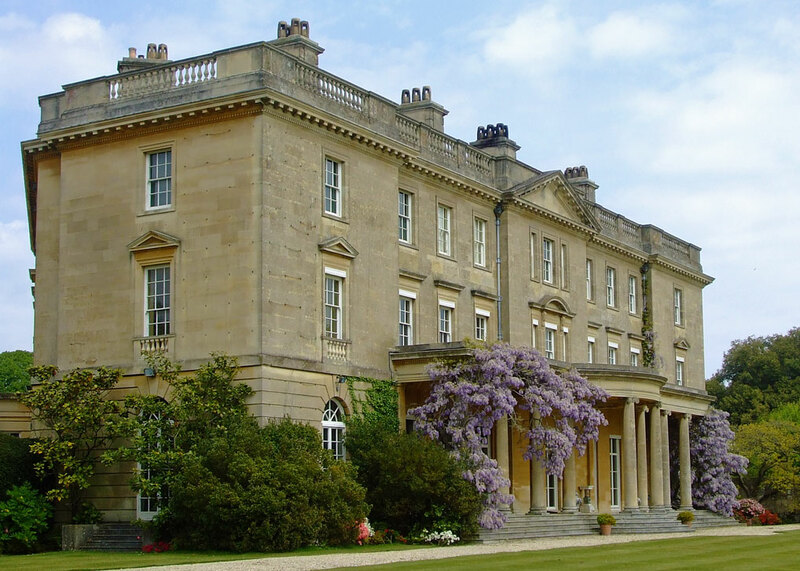 The wisteria-clad Exbury House is not open to the public, but, re-named HMS Mastodon during World War Two, had a role as part of the administrative network supporting D-Day, the invasion of occupied France. On 18th April 1944, a black Junkers 188E German bomber appeared flying a meandering course, low over the nearby Isle of Wight. Naturally, it came under fierce attack from anti-aircraft batteries. Curiously, the pilot took no evasive action and the only thing that dropped from the bomber was a number of red flares. Eventually, the aeroplane flew over to the mainland in the Beaulieu area, where two RAF Typhoons pounced on it, shooting it to pieces. Given that this corner of southern England was where part of the invasion force was being assembled, security was understandably tight; no enemy aircraft would be allowed home with revealing photographs of landing craft, or intelligence of any kind. The Junkers was finished off by more AA fire, before crash-landing close to Exbury House. The Junkers 88 had a crew of four; but this one was carrying seven young Luftwaffe NCOs, three of whom must have been sitting on their comrades’ knees. All seven perished – one made it just as far as the hospital, saying nothing before he died. The mystery is the subject of a book, The Exbury Junkers by John Stanley. He spent six years meticulously researching the story, though I don’t know whether he found the conclusive answer to the puzzle of what these young men were up to. They certainly weren’t trying to hurt anyone. If they were engaged in espionage, it was a pretty clumsy effort. Were they lost? Were they trying to defect to Britain? The story inspired the Nevil Shute novel, Requiem for a Wren. Shute was based at Mastodon and came across the aircraft shortly after it was brought down. This curious enigma stayed with him, and he wove it into a work of fiction, one of Shute’s bleaker works. The gardens are stunning and had not heard the story of the Junkers. Really amazing. Would be interested to know about musical fountains of Britain too! As I am fascinated with fountains and for last couple of years associated with PremierWorld, which designs and manufactures musical fountains. The gardens are stunning … haven’t visited for a couple of years now … think 2017 could be the year to go again. 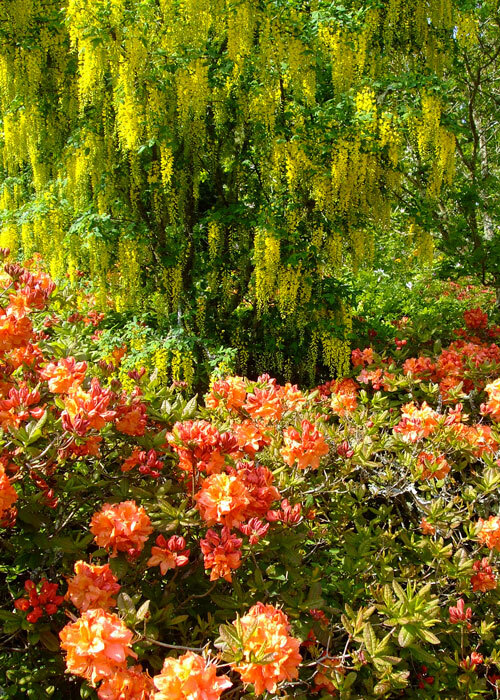 Looks like a great place for Rhododendrons and Azaleas! Beautiful stunning photos, the first one in particular, it could be a painting. You do tell very interesting stories. I felt slightly sorry for the Junkers’ pilots, especially if they were lost. I’d be grateful if you would forward this post to all those who expressed interest in the Exbury Junkers mystery. Thanks to everyone for expressing interest in the Exbury Junkers mystery. It is indeed a very sad story, and although over six years I managed to find answers to some of the intriguing questions I am certain that the mystery will never full be solved. If you’d like to delve deeper into the story then my book is available from woodfieldpublishing.co.uk or Amazon or any other online retailer. Also, the sorry is being featured on the BBC 1 programme ‘Inside Out South’ probably on 13 March 2017. You will need to be able to access BBCI South (Freesat – 964; Sky – 964) or it will be available on BBC iPlayer for 30 days immediately after transmission. And finally, I will be hosting a series of guided walks at Exbury over the weekend of 3/4 June telling the story of the German bomber mystery . We will visit the crash site and all other locations that feature in the story in and around the gardens. The garden is exquisite, but I was really interested by the mystery airplane! What beautiful gardens! I an intrigued by the Junkers enigma – how strange! Doesn’t it seem most likely that the young Germans were trying to defect? This sounds like a plot line for an episode of Foyle’s War. Those gardens must be fabulous; the azaleas are gorgeous. An interesting story regarding the Germans, please share if you find out any more. Those mid-Spring colours and blossom are simply beautiful – it is hard to believe that they will be back with us again soon as I contemplate the view from the window which is currently grey and drizzly. Love that first photo, glorious reflections in the lake. A curious story about the Germans. What a lovely property! Writing this in February I know its not spring there yet, but thanks for the hope that it won’t be long before we see those kinds of blooms again. Those are lovely gardens. How interesting, I’d never heard about the Junker before. Beautiful gardens. Well the writings may have been bleak, but oh my this is such a beautiful landscaping, it is such a wonderful sight for my winter eyes, which have been so over loaded with grey skies and dirty snow (when you can find snow) big melt down right now. Until of course the next winter blizzard returns. Lovely post and information thank you. Your title caught my attention right off too! What a gorgeous place, especially that top photo. Yes, I’ve seen that. You’ll also see that John Stanley has posted some additional information as a comment here. Interesting story. Love the colours in your photographs.